1. To what recent news item does this cartoon refer? 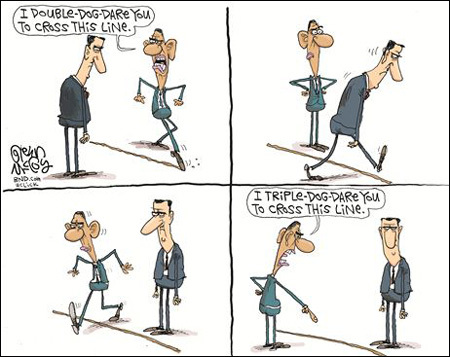 a) Iran’s failure to end its nuclear weapons program will be a “game changer” for the U.S.
b) any use or transfer of Syria’s chemical weapons would constitute a “red line” for the U.S.
2. Who is the person with President Obama in this cartoon? 1. b) any use or transfer of Syria’s chemical weapons would constitute a “red line” for the U.S.